The east side of Gwinn Commons, looking southwest. Ashton Hall can be seen in the background. Copyright held by Seattle Pacific University. 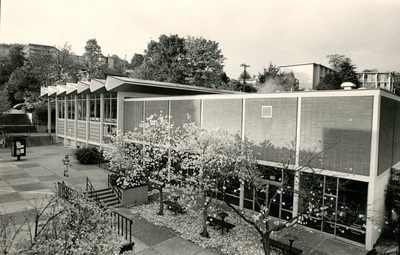 Contact SPU Library Archives for permissions: http://spu.edu/library/archives. The image is expected to be free of copyright in the United States 120 years after its creation date, though copyright could still apply outside the U.S. and has not been determined.